Promote a culture of peace and nonviolence among children. Volunteers of Shanti Fund (VOSF) have promoted the educational exchanges on Long Island for over last two decades by planning breakfast meetings to which speakers in many different fields of expertise were invited to speak; having round table discussions where prominent activists, diplomats, and elected officials have discussed on-going world issues of concern; and by sponsoring a “Teachers Exchange Program” between India and the USA. 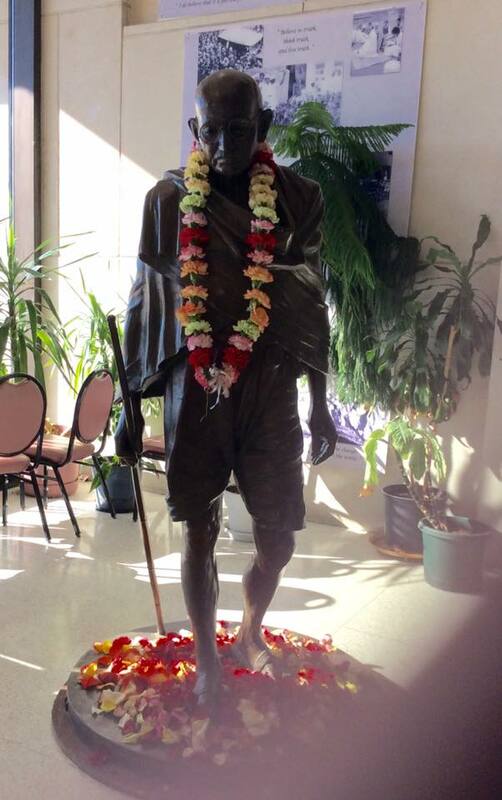 Officials of Suffolk County noticed the activities of the Volunteers of Shanti Fund and invited Volunteers of Shanti Fund to build a Gandhi Memorial on the county property. For the last several years, following the United Nations declaration “To Promote a Culture of Peace and Nonviolence Among Children,” Volunteers of Shanti Fund have been inviting children from several area schools, Girl Scouts, Boy Scouts, and youngsters from Indian cultural organizations to promote Gandhian values. Every year weather permitting Volunteers of Shanti Fund commemorate Gandhiji’s Salt March symbolically with a “Peace Walk” around the H L Dennison Building on Saturday prior to October 2, when local school students present their peace related activities. On October 2, VOSF celebrates the Gandhiji ’s birthday in the presence of dignitaries and community members. This year is very historical. Worldwide celebrations are planned to celebrate 150th Anniversary of Gandhiji's birthday from October 2, 2018 to October 2, 2019. Shanti Fund already undertook couple of activities to commemorate the 150th anniversary and many more are planned. Please visit this website for updated information. For additional information please reach out to us via the contact page. Built by an American sculptor in 1998, located at the Plaza Level of the H. Lee Dennison Building in Hauppauge, New York. Volunteers of Shanti Fund are committed to promote peace and enlightenment through education. VOSF have reached out to many likeminded organizations and local schools to promote peace education and building bridges since 1994. Yearlong efforts culminate during two days celebrations of UN International Day of Nonviolence (October 2 – Gandhi’s Birthday). Dozen or so faiths unite every year to pray together on January 30, Gandhi Punya Tithi..